A 62-year-old female reported to the surgical clinic with complaints of pain in right upper quadrant of the abdomen. Clinical examination did not reveal any palpable mass or tenderness. An ultrasound showed the presence of a hypoechoic mass in the right lobe of the liver. An upper gastrointestinal endoscopy showed a nodular mass at the third part of the duodenum. A biopsy from the duodenal nodule showed the presence of a neuroendocrine tumor. The patient was subjected to a DOTATATE positron emission tomography, which showed tracer uptake in both, the mass in the right lobe of liver and the duodenal nodule. In view of the above, the patient underwent a right hepatectomy and infra-ampullary duodenectomy. The right hepatectomy specimen showed the presence of a well-circumscribed 10 × 8 × 8 cm mass with pale yellow-colored homogenous, firm tumor with peripheral areas of hemorrhage. On opening the infra-papillary duodenectomy specimen, a 2 × 2 cm nodule was seen. The cut surface of the duodenal growth showed a similar pale yellow-colored homogenous firm tumor reaching up to the serosa [Figure 1]. Hematoxylin and eosin (H and E) sections from the duodenal nodule showed a well-circumscribed tumor in the submucosa and reaching up to the subserosal plane. The tumor cells were arranged in characteristic nested pattern separated by thin vascular septae. The individual tumor cells showed central round to oval nuclei with stippled chromatin and dense eosinophilic cytoplasm. Mitosis was 8 per 20 hpf. H and E sections from right hepatectomy specimen, in contrast, showed a well-circumscribed lesion with tumor cells disposed in sheets and vague nested pattern. The individual tumor cells had a signet ring morphology with eccentrically placed hyperchromatic nuclei and abundant vacuolated cytoplasm. Periodic-acid Schiff-Alcian blue stain did not reveal any intracytoplasmic mucin. The tumor cells in both duodenal growth and liver mass expressed cluster differentiation factor 56 (diffuse and membranous), neuron-specific enolase (diffuse and cytoplasmic), synaptophysin (patchy and cytoplasmic) and pan-cytokeratin (dot-like cytoplasmic) on immunohistochemistry. Chromogranin was, however, negative in tumor cells in both sites [Figure 2] and [Figure 3]. In view of the site, histomorphology and immunohistochemical profile, a diagnosis of metastatic neuroendocrine carcinoma was made. At 6 months of follow-up, the patient is asymptomatic and free of any symptoms. Signet ring cells are commonly associated with adenocarcinomas of gastric, colonic, breast, and prostatic origin. However, nonadenocarcinoma malignancies, such as melanoma, germ cell tumors, plasmacytomas, squamous cell carcinomas, and neuroendocrine tumors, have also been reported to exhibit signet cell morphology. Signet cell neuroendocrine tumor in the liver is a rare entity and have been usually reported as primary tumors in literature., Presence of signet cells in the liver has a varied list of differential diagnosis, which include hepatocellular carcinoma, cholangiocarcinoma, clear cell renal cell carcinoma, melanoma, adenocarcinoma, mixed adenoneuroendocrine carcinoma (MANEC), and neuroendocrine carcinoma. However, in the index case, the presence of a duodenal neuroendocrine tumor points to the liver mass to be a metastatic focus. The histomorphology of the metastatic site had a signet ring morphology in complete contrast to the morphology of the primary tumor. The absence of mucin, as demonstrated by lack of staining by PAS-Alcian blue and immunoprofile of the tumor cells, helped in establishing the diagnosis. MANEC and collision tumors (CT) are close differential diagnoses in this case. MANECs are characterized by a dual composition of neuroendocrine and adenocarcinoma, each contributing to at least 30% of the tumor. While CT are juxtaposed tumors with two or more types of differentiation. However, the index case did not show any evidence of adenocarcinoma, even after extensive grossing of both the primary and metastatic site. This case brings to light the possible change in tumor morphology at the metastatic site. This is a lucid example of tumor heterogeneity leading to changes in morphology at the metastatic site. 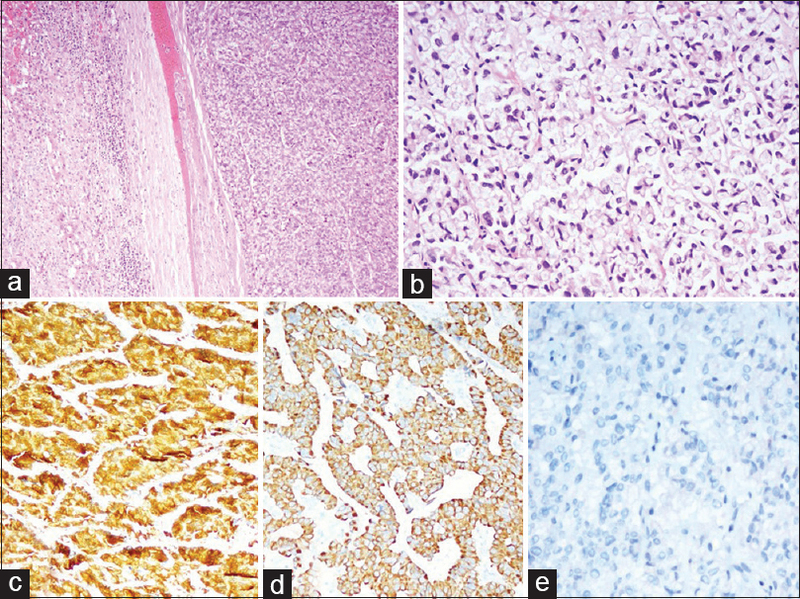 The case also highlights a rare signet ring-like morphology of metastatic neuroendocrine tumors. On the use of immunohistochemistry, the poor sensitivity of chromogranin is seen in the index case. This can be explained by the fact that chromogranin stains the neurosecretory vesicles which are not well developed in poorly differentiated tumors, limiting its otherwise vast utility. Lessons learnt from the index case include signet ring morphology can be shown by neuroendocrine tumors, metastatic neuroendocrine tumors can show a different morphology from the primary tumor, and that chromogranin is a poor choice in assessing the poorly differentiated neuroendocrine tumors. Zhu H, Sun K, Ward SC, Schwartz M, Thung SN, Qin L. Primary hepatic signet ring cell neuroendocrine tumor: A case report with literature review. In: Seminars in Liver Disease. © Thieme Medical Publishers; 2010. p. 422-8. Haq S, Batra VV, Majumdar K, Javed A, Agarwal AK, Sakhuja P. Signet ring cell neuroendocrine tumor liver with mesenteric metastasis: Description of a rare phenomenon, with literature review. J Cancer Res Ther 2015;11:658. Mann SA, Saxena R. Differential diagnosis of epithelioid and clear cell tumors in the liver. In: Seminars in Diagnostic Pathology. Elsevier; 2017. p. 183-91. Nasir A, Coppola D. Neuroendocrine tumors: Review of pathology, molecular and therapeutic advances. Springer; 2016. Gurzu S, Kadar Z, Bara T, Bara TJ, Tamasi A, Azamfirei L, et al. 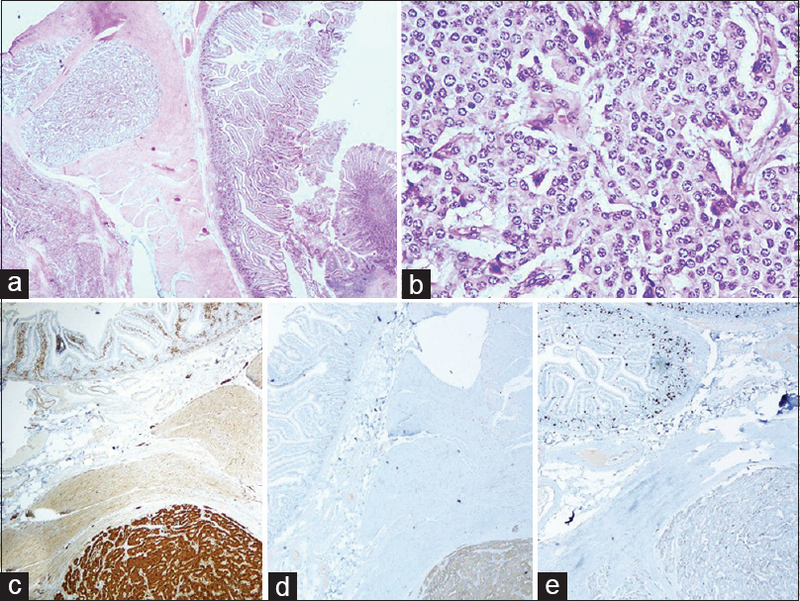 Mixed adenoneuroendocrine carcinoma of gastrointestinal tract: Report of two cases. World J Gastroenterol 2015;21:1329-33. Marusyk A, Polyak K. Tumor heterogeneity: Causes and consequences. Biochim Biophys Acta (BBA)-Reviews Cancer 2010;1805:105-17. Gut P, Czarnywojtek A, Fischbach J, Bączyk M, Ziemnicka K, Wrotkowska E, et al. Chromogranin A–unspecific neuroendocrine marker. Clinical utility and potential diagnostic pitfalls. Arch Med Sci AMS 2016;12:1.